Beetroot Poriyal Stir-fry with Badam/Almond Powder. 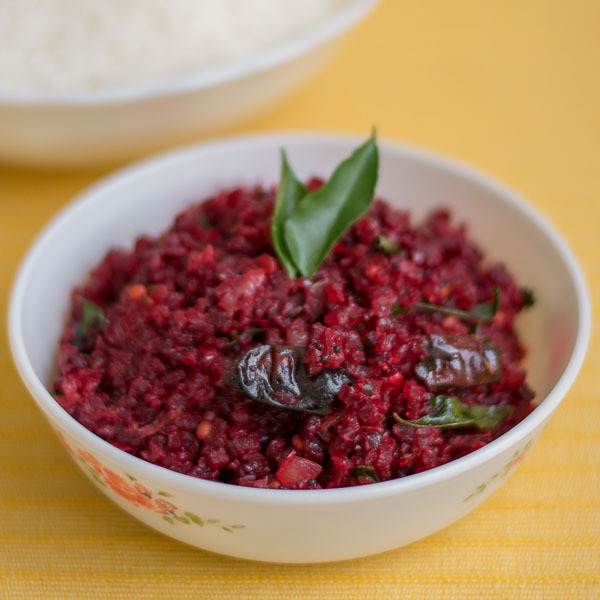 Quick and easy recipe for Beetroot Poriyal / thoran without coconut . South Indian Tamilnadu style steamed vegetable stir-fry made with almond meal . Its healthy and vegan too. I had already posted the recipe for beetroot poriyal made with coconut. 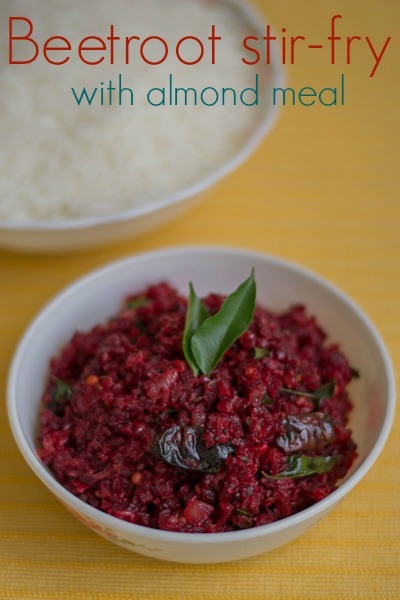 This beetroot poriyal recipe does not use coconut. This recipe has the addition of almond meal/powder. 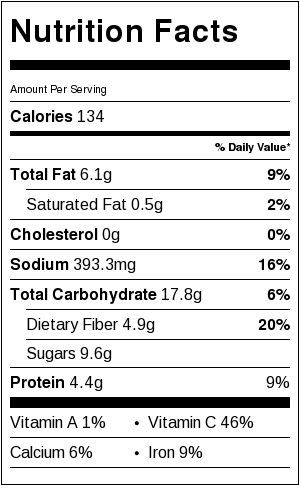 Almond meal adds a very nice richness to the stir-fry without being too heavy. This recipe makes for an everyday vegetable stir-fry. My young son loves beets. I think its the color. Its an easy, healthy and a quick recipe. 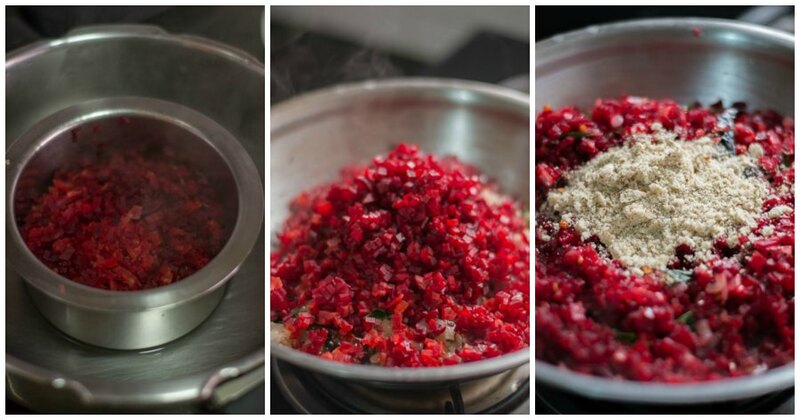 First the beetroot is steamed and then its tempered the indian way. First lets make some coarse raw almond meal. Its very simple. Take 20 almonds and pulse it for 5-6 times in the mixie. You are done. Transfer the meal to a small bowl and set aside. Heat oil in a saute pan and add in the urad dal, mustard seeds, cumin seeds, curry leaves and dry red chillies. Let it splutter. Fry for a minute until the urad dal is lightly brown. Then add in the onions, asafoetida and salt and fry till soft and tender. About 3-4 minutes. I have a trick for quick steaming the veggies. I put the cut veggies in a bowl and place the bowl in a pressure cooker filled with 1 inch of water. Pressure cook it for 5 minutes (2 whistles for al-dente, 3 whistles for soft texture) in a medium flame and that gives perfect steamed vegetable every single time. Reduce the time if you want it a little al-dente. Also no need to drain any water from the cooked vegetable as there will not be any. Its a very neat technique. OK. Now back to the pan. Add in the steamed beets and saute for a minute more. Add the almond meal and toss until combined. Switch off the flame and remove it from heat. Serve with rice. Take almonds and pulse it for 5-6 times in the mixie. You are done. Set aside. Heat oil in a saute pan and add in the Urad dal, mustard seeds, cumin, curry leaves and dry red chillies. and let it splutter. Fry for a minute until the urad dal is lightly brown. Then add in the onions, asafoetida and salt and fry till soft and tender. About 3-4 minutes. Liked your website with lot of healthy recipes and usage of traditional ingredients. I liked your tip for steaming vegetables. But can you let me know if I have to place a lid over the bowl. Hi Sunita, No need to place a lid over the bowl. Thank you!